Very gentle cow who is bred to be big bodied with big horn. 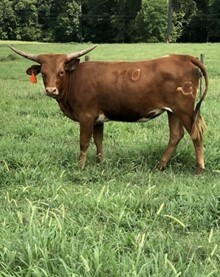 She was bred by Lake Country Longhorns and we look forward to what she will produce for us. Her calves are in such demand that we have never been able to keep one until weaning!